This tutorial is for all those who have already done their BVN registration and also have more than one bank account. Note that you only need just one BVN for all your bank accounts. So for all those who have BVN and also have more than one bank account all what you have to do is to link your BVN to your other accounts. So am going to show you how to easily link your BVN to all your bank accounts right from the comfort of your home and avoid all the stress of queing in the camping hall. 1. ACCESS BANK: You can easily link your BVN no to your Access bank account by simply texting BVN (space) your account no (space) your BVN to 20121. You can visit this LINK and submit your account no, name of bank where your bvn was issued and your issued bvn no. 3.ECOBANK: Dial *326*9# on the no registered or linked to your account and follow the instruction. If you already registered for the e-Banking then login,go to your profile then select LINK under the NO BVN LINK HERE. If you registered for e-Banking, just login, click on the NO BVN link and input your details. Click on this LINK to submit your details. ⇒ Select the BVN link option on the menu screen. 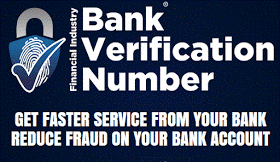 ⇒ Confirm your BVN inputted is correct. ⇒ You might be asked to confirm your no after completing the steps above. ⇒ If the mobile no is correct, them you can submit but if its not then you can correct it. For all those who have registered for online banking, you can also submit your BVN details on the internet banking portal. You can click on this LINK to submit yout details online directly. 8. HERITAGE BANK: For those using Heritage bank, Click on this LINK to submit your BVN online. Fill in your account No, OTP(which is a One Time Password) and your BVN no. 9. KEYSTONE BANK: Click on this LINK to submit your BVN no. All a customer has to do is dial *919*6# with the telephone number that was used to open their account and then provide their BVN on the prompt. Directly link your bvn no by clicking on this lINK. Example: BVN 11234597001 to 30909. Note: You must send the text to the Phone number linked to your account. You can visit this LINK to submit your details. 13. Sterling Bank: Send your BVN, account name and account No to customercare@sterlingbankng.com. 14. UBA: For UBA customers, Dial *919*6# on the mobile number linked to your bank account and follow the instruction. 15. Union Bank: You can link your BVN to your Union Bank account by clicking on this LINK. 16. ZENITH BANK: You can send your BVN, account number, phone number, DOB, Bank where your BVN was issued and date of registration as Direct Message (DM) to @ZenithBank on TWITTER. Send the above details via email to zenithdirect@zenithbank.com. If you have Zenith internet banking account, just log in to your I-Banking profile and update your BVN details. So that's all. If you think there is any one missing just let me know via the comment box below. If this has been helpful, don't forget to share.